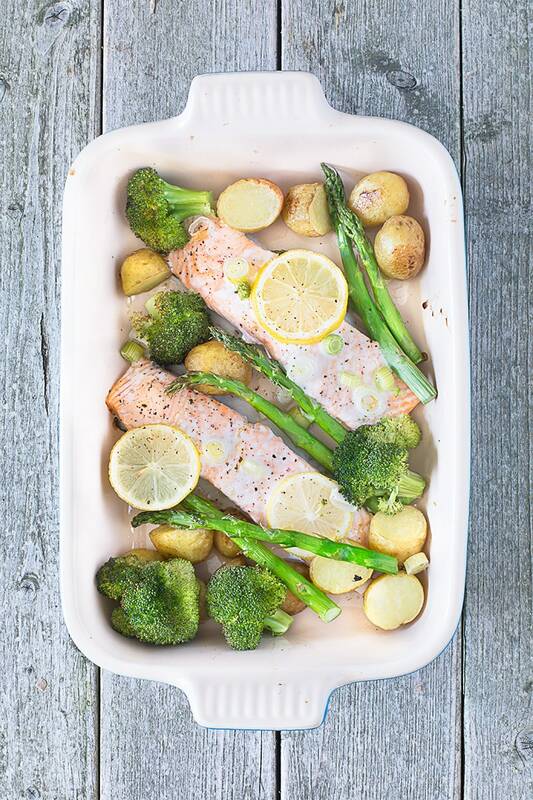 This one-tray baked salmon with summer vegetables makes a delicious dinner with only 5 minutes of prep and virtually no washing up. There are two reasons I’ve created this recipe to share with you (well actually three if you include the fact that it’s yummy and that should be reason enough by itself!). This first is that I’ve developed a real liking for this super low effort cooking malarky. Looking back through my recent recipes it definitely seems to have become a bit of a theme with me (3-minute lasagne, easy Irish stew, and one-tray roast chicken to name a few). I feel like I’ve been so busy recently and without a selection of easy dinners to choose from I very much suspect we’d default back to beans on toast several nights a week (we still do that a bit because despite my best cooking efforts it’s one of the boys’ absolute favourites – a fact which hurts me every time they tell me!). This one-tray baked salmon is really about as easy as it gets when it comes to cooking, a little bit of rough chopping, setting the oven to the right temperature, and remembering to take the food out once it’s done is just about all it needs. I’ve created this recipe to serve 2 (as then it fits nicely in one tray) but you can easily double it up to 4 by overflowing into an extra tray. 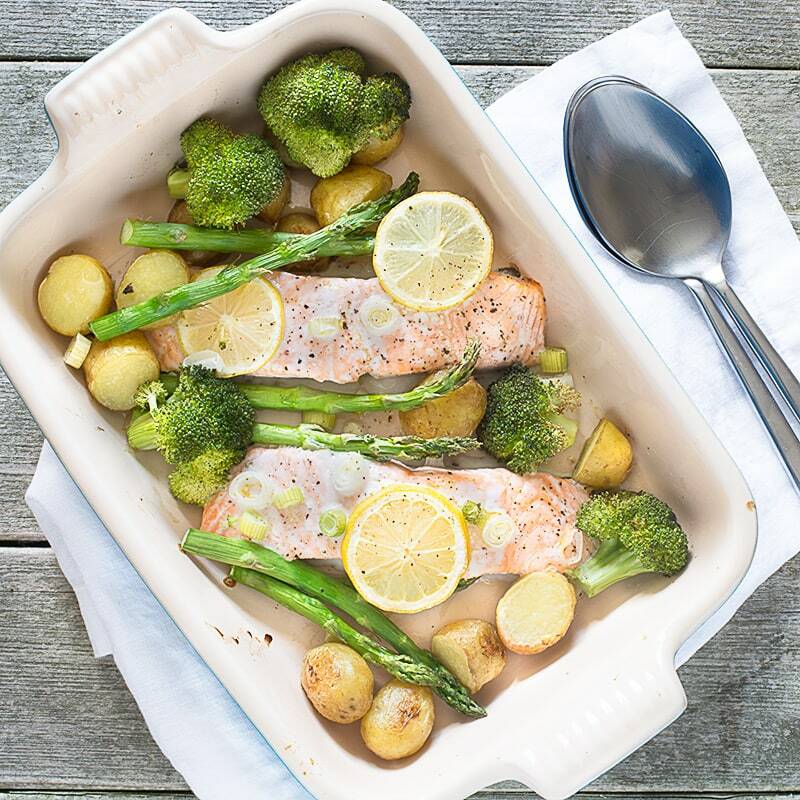 The second reason I created this salmon recipe is that I wanted an excuse to show off my new Le Cruset baking dish – isn’t it lovely. It came from Steamer Trading (they sent it to me as a gift – lucky me 🙂 ) which is one of my absolute favourite cookware shops. I first discovered their Chester store by accident, I had 5 minutes to kill when I was out shopping so I thought I’d pop in for a browse and see if they had anything interesting. I don’t think I’ve ever been in such a Tardis-like shop in my life, it looks tiny from the outside but seems to go on forever once you’re in and it’s full of shiny-kitchen things that make me want to go on an impulse buying spree. Sadly the boys lack my enthusiasm for cookware so I don’t get to go there as much as I’d like, but fortunately they have a nice website so I can while away my time on there instead :-). You can also find them on Twitter, Facebook and Instagram if you’d like to take a look. Chop your potatoes into bite-sized pieces, put the potatoes into your baking tray and toss them in the olive oil (2 tsp). Put the potatoes into the oven to bake for 15 minutes. While the potatoes are cooking, cut the broccoli into small florets (discarding the stalks), slice the spring onion and slice the lemon (you can also cut it into wedges if you prefer). Remove the potatoes from the oven and reduce the oven temperature to 180ºC/160ºC fan. Add the broccoli, spring onions and asparagus tips to the tray and toss them in the oil with the potatoes. 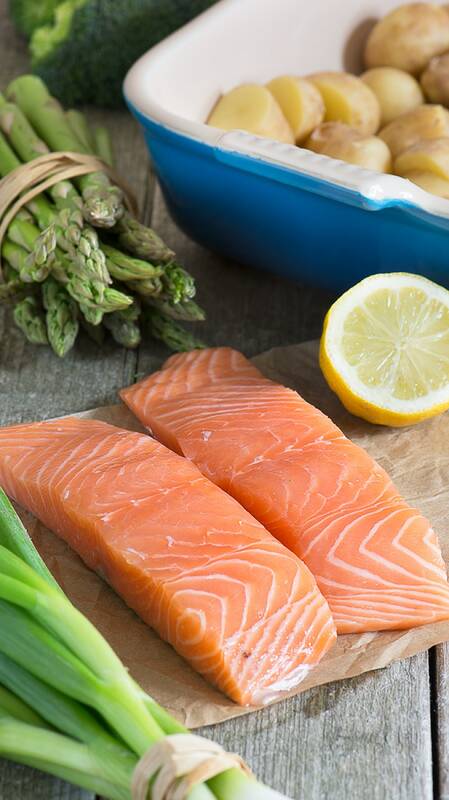 Make two spaces between the vegetables and add the salmon fillets (make sure that nothing is piled up as it won’t cook properly). Place the lemon slices randomly on top and season with salt and pepper. 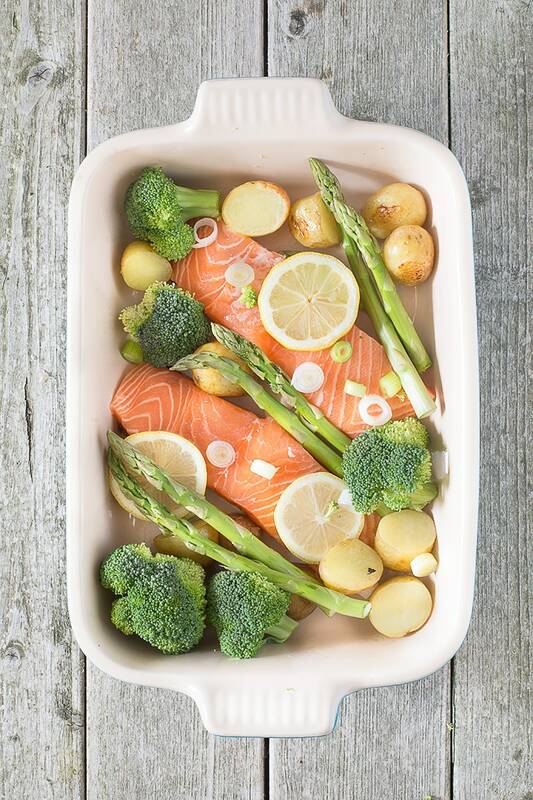 Return the tray to the oven for 18-20 minutes until the vegetables are tender (the broccoli will still have a decent crunch to it) and the salmon is cooked through. This is the estimated nutritional information per serving. Excluding additional salt added during cooking. Please refer to my guide to Charlotte’s Lively Kitchen nutritional information if you want to learn more about how this is calculated. 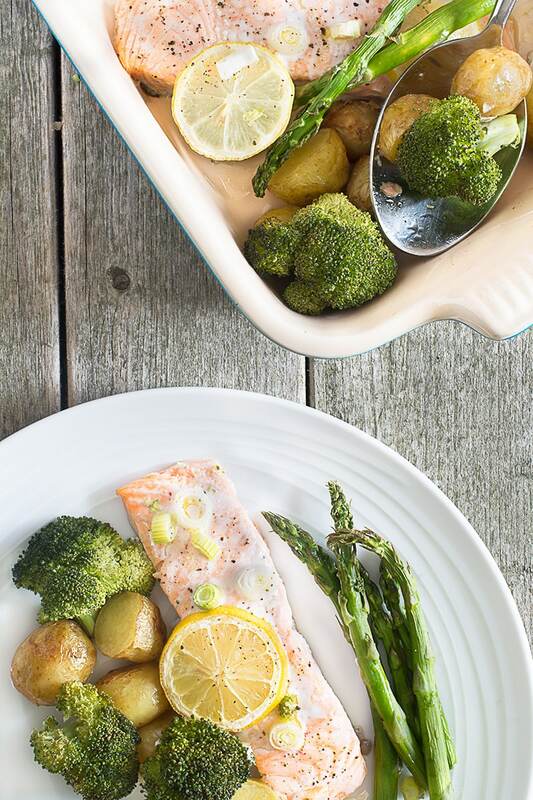 This looks delicious, perfect for our paleo regime! Thanks Kirsty. I kept spotting you from afar at BML, saying I was going to go over and the realising you’d disappeared again! I’ll have to make sure I catch you next time we’re at the same event. Thanks Eb, the Le Cruset dish is lovely isn’t it! I actually found the salmon much easier to photograph than the chicken one I made a while ago as chicken is so pale. 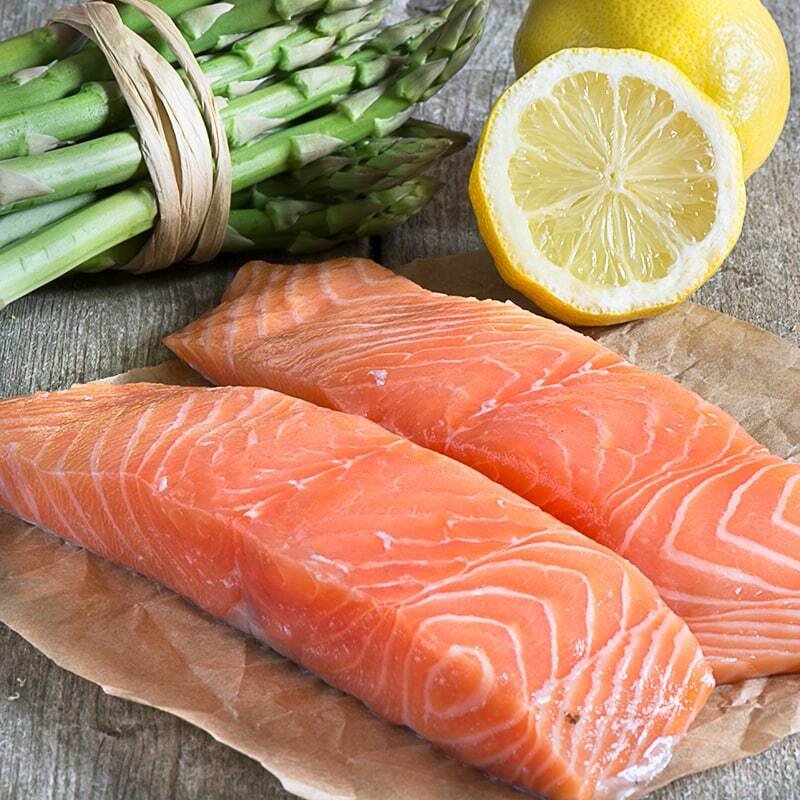 I prefer the “before” pictures of the salmon as I love the gorgeous colours in the salmon and lemons. Thanks Sarah, I’m completely hooked on the idea of low effort dinners at the moment too – keep an eye out as I’m sure I’ll be sharing more soon.